It is a quiet day here in anticipation of 8 teenage girls who will be coming over to help celebrate my daughter's birthday later today! I have sewn the binding onto the Triangle Quilt made earlier this month and plan to finish slip stitching the binding by hand over the next day or so. The binding fabric is Mingle by Monaluna for Kaufman Fabric, purchased at the Fabric Shack. The red fabric really frames the quilt. Hope you have a great weekend! 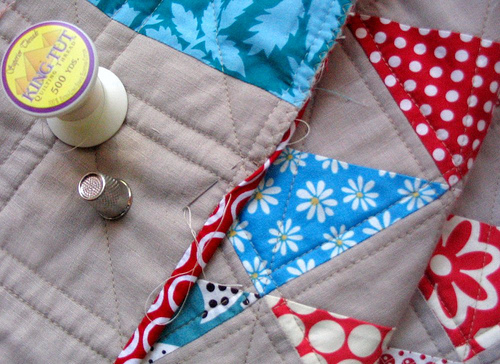 I am hoping to squeeze in some sewing time for a Mini Quilt to be blogged on Monday! What are you working on? You are so right, the binding really sets of the quilt. It looks fantastic and I hope you don't find the hand stitching as tedious as me. I have a few projects on the go, a strip quilt for Alfie, the wonderland fabric to cut and I am waiting on some Anna Maria fabric to start a string quilt - without the strings! Hope that makes sense :) Enjoy the party! You've done such a great job with the quilting! I love framing with red. I have just started my first ever quilt (so I'm a bit embarrassed if you happen to come by when I finally get my act together to post about it! ), but the quilty heaven around here just makes me want to forget about the other commitments and get right in there! 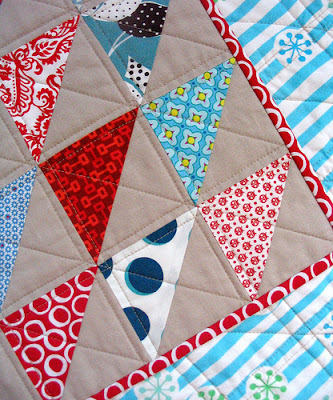 As always, your quilt is beautiful and I do love the red binding. Like Tania above, I'm working on my first quilt (small coin quilt)...I have the top done and anxious to get going on the rest. Thanks for the insiration! Oh, that red binding is great! Don't you love it when it really comes together like that? I too love the binding in the quilt! It looks so great! I am a new quilter, as I have said before, and I know nothing about binding. I really don't want to take the time to do any hand sewing. Have you ever machine sewn on both sides of the biding? Just gorgeous and just love the way the greys? are coming into vogue - what fabric is that, please? PS - maybe the grey makes the brights and white sparkle - what do you think? I love this quilt! It just really pops. This quilt is turning out so well. I love that you hand stick the binding. That's something that truly intimidates me. I usually cop out and end up machining it. The binding is my favorite part! For you it sounds like the calm before the storm....have fun with the birthday party! the quilt looks great. I love the colors you chose for this quilt! Hand sewing the binding is one of my favorite parts of making a quilt. That red binding looks perfect. I think I am going to work on a mini quilt for Monday, too. I have to take a little break from knitting and get back to my sewing machine. I have two big quilts to finish, but that won't be happening this weekend. Love the triangles and the binding. Thanks for the fabric chack link! Love your triangle quilt. And bindings are the icing on the cake!